Golden Time is an anime filled with realistic romance, gripping personal drama, and some thoroughly enjoyable low-key comedy. It also has an ending so poorly put together that it almost seems like a deliberate attempt to undermine everything that has come before. One of the strongest points of Golden Time is its constantly evolving characters. None of the main cast are static and are thus always changing based on their experiences in the anime. Moreover, the characters are quite human. They all make mistakes and try to learn from them—though this is often a constant struggle. By far the character who develops the most in the series is the female lead, Koko. At the start of the show, she defines her life around the man she loves and forces everything into her preconceived narrative of how her life should be. Losing this anchor, she finds herself adrift in life with no friends or real goals. And while she does soon make the male lead, Banri, the center of her world, she desperately tries to learn from the mistakes of her past (one-sided) relationship. She works to be less jealous and overbearing and even comes to make friends of her own. By the end, she actually seems to be a person who could survive on her own if needed. It's always a joy to encounter such well-done and gradual character development in an anime. The second half of Golden Time revolves around the role of fear in a relationship and how different people react to it. Banri always runs from his fears. After losing his memory, he ran to Tokyo—as far away from his old life as he could get. The idea of not being who everyone knew him to be and failing to live up to pre-amnesia expectations terrified him. It is in Tokyo that he meets Koko and begins his post-amnesic life. Yet when Koko and he have any sort of problem (or potential problem) in their relationship, his first instinct is to put distance between him and her. As the series nears its end and it becomes apparent that his memory will be restored—and he will thus lose all memories of his post-amnesia life—Banri still shows all the signs of preparing to run even as he claims the contrary to Koko. Instead of confronting the problem, he refuses to tell Koko about his lapses and even literally takes up running for exercise as things come to a head. Because of how Koko deals with fear, Banri's actions couldn't be worse. Shortly past the series midway point we learn of Koko's greatest fear (being left behind by Banri). When almost killing him (and their friends) by falling asleep at the wheel, she reacts radically—namely she severs all ties with those around her. While Banri runs from his fears, Koko confronts them—though often prematurely and in a negative way. Despite not actually losing Banri (or being blamed by him in any way), she proactively tries to break up with him, hoping that doing so on her own terms will help minimize the hurt. The fear of losing her own happiness prompts her to give up her own happiness. It is paradoxical, but also very human. Bad – Haven't We Seen This Before? After the car accident, Koko lays her fear on the table and the two reforge their relationship in one of the series' dramatic climaxes. Unfortunately, it's only a few episodes before things begin to go wrong again in all too similar ways—as this time Banri's memory begins to return and he attempts to keep the effects largely hidden from Koko. But when he literally runs away from her after a brief loss of his post-amnesic memories, she once again is overcome by her own fear of abandonment and breaks up with him. Having two such similar dramatic climaxes almost back-to-back largely robs this later one of its emotional impact. Though it is human for people to repeatedly make the same mistakes despite the best of intentions, as a viewer, it feels repetitive—not to mention it's hard to sympathize with either Banri or Koko as they should have known this would happen as it already had happened once before. More than that, it makes Banri specifically seem like a moron due to his confusion about why Koko would want to break up with him when she literally explained her fear to him just a few short episodes before. Thus, the series' final conflict feels more like a poorly done retread instead of the grand dramatic climax it should have been. Even aside from the weak climax, the ending of Golden Time is, frankly, a complete mess. The final episode of the series is an unwieldy monster with far too much story to tell in far too little time. Banri gets his memory back (and loses his more recent ones), moves back home, spends his vacation days with Linda, discovers his email has been hacked, finds journals explaining the past year and the people in it, meets Koko, gets his post-amnesia memories back, and reconciles with Koko. So much happens that it feels like an entire arc of the story has been abridged into 20 minutes. But even then there is so much left out. There is absolutely no resolution for the rest of the characters in the anime. Mitsuo never comes to win or give up on Linda and Chinami never confesses that she actually does like Mitsuo to his face. These plot lines that we have spent hours on are simply left forgotten. And then the world-breaking supernatural element known as “Ghost Banri” is thrown into the mix. In the final scene of the series, Banri runs to the bridge where he lost his memories to intercept Koko and reunite with her. But when he gets to the bridge, the whole ordeal becomes metaphysical in nature. As he crosses, he runs into Ghost Banri—previously either thought to be a true ghost or his past personality viewing post-amnesic Banri's life—and the two converse—despite Banri having both his pre- and post-amnesic memories back at that point. Then Linda suddenly runs up and begins talking to the ghost who, up until that point, had only been seen or heard by Banri. This brings up a whole slew of questions: Is Linda really there or is she imaginary? Does she really see Ghost Banri? What is Ghost Banri? Does Koko, standing at the edge of the bridge, see/hear this also? Is this all in Banri's head? Unfortunately, none of these questions are answered and we are left completely confused as the happy ending and epilogue fill out the anime's final seconds. If you disregard the mindboggling final episode, Golden Time is a decent—bordering on excellent—romance anime. It has great dynamic characters that develop realistically and does a great job at looking at how personal insecurity and your way of dealing with fear can affect your relationships. As I mentioned in the review of the first half, the series' greatest weakness is the appearance of supernatural elements—I'm looking at you, Ghost Banri—which do nothing to the story other than make it more convoluted and less realistic. However, even with this nagging negative, Golden Time is worth a watch to anyone who wants an anime about a real relationship between adults. It's a great mix of romance, comedy, and drama that will keep you invested and interested from beginning to end. 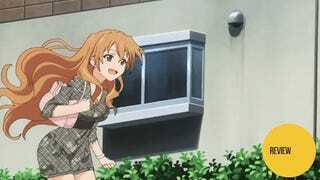 Golden Time aired on Tokyo MX in Japan. It can be watched for free and with English subtitles on Crunchyroll and Hulu.